Airpot coffee brewers are ideal for those who want to make fresh coffee in one place and then transport it to another. Meeting rooms, breakfast bars, and waiting rooms will enjoy great tasting coffee without having to brew it in the same room. The convenient Airpot keeps the coffee hot and fresh for hours and the digital timer enables users to make brew cycle adjustments from the front panel. This Airpot coffee brewer brews 7.5 gallons of perfect coffee per hour and brews directly into a 1.9 liter Airpot for added convenience. A hot water faucet is also available for making teas and hot chocolate as well. 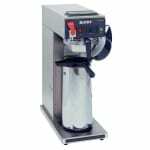 If you have a business that needs high quality coffee on the go then invest in this Airpot coffee brewer today!